This coming weekend will see the celebration of Maria Thereza Alves as recipient of The Vera List Center’s Prize for Art and Politics, a screening of Yoko Ono’s The Third Eye, a panel discussion between Alves and Ruth Wilson Gilmore, and the exhibition opening of Alves’ exhibition. Please be sure to RSVP, individually for each event you plan to attend. Two-day conference/ exhibition/ keynote focused on Seeds of Change, a multi-year art project, tracking ballast flora and what it tells us about the ongoing violent legacy of colonialism. Note RSVP links and locations differ for each event. With TJ Demos, Seth Denizen, J. Kēhaulani Kauanui, Tomaz Mastnak, and Kenneth White. With Jane Bennett, Katayoun Chamany, Lara Khaldi, Marisa Prefer, and Radhika Subramaniam. 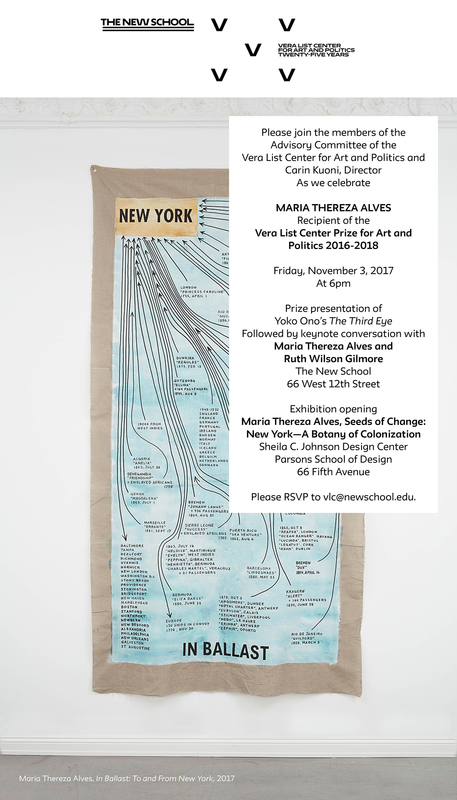 6-6:45pm Keynote Presentation of the Vera List Center Prize for Art and Politics 2016-2018 to Alves, followed by a conversation between Maria and Ruth Wilson Gilmore and the opening of Alvares exhibition Maria Thereza Alves, Seeds of Change: New York—A Botany of Colonization. SATURDAY the focus is on the projects of the Finalists for the Vera List Prize for Art and Politics, and the ways theirs resonate with Alves’ Seeds of Change. With Gulf Labor, Forensic Architecture, Zoe Carey, and Galit Eilat. With IsumaTV, House of Natural Fiber, MadeYouLook, Amanda Parmer and Whitney Slaten.